Home sales have slowed considerably in Eagles Ridge neighborhood, located inside of Golden Eagle Plantation. In case you have never seen this usually popular NE Tallahassee neighborhood, it is situated just inside the Southern gate of Golden Eagle, and features homes near or on the Tom Fazio golf course. In the past, it has been very popular with both retirees, as well as young professionals. I myself built a home in Eagles Ridge in 1995, but moved not long after as Michelle and I started to grow our family. 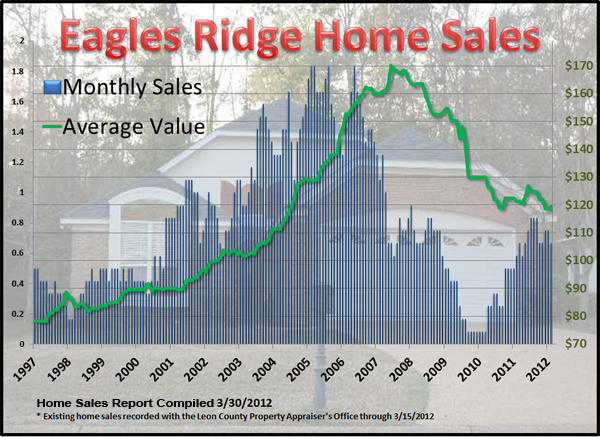 Eagles Ridge is an interesting study, as average price and average value means very little. There are homes on the golf course, homes on the water, and interior homes. Each has a different land value, and thus a price per square foot evaluation across the board does not account for the differences in the land. Overall, we see that unit sales are down considerably, and that usually means that homeowners are holding on for their values. The following information shows all the homes sold in Eagles Ridge for the past 9+ years. Can you guess which properties are on the water or golf course? Please check back again for more neighborhood reports in Tallahassee, including Eagles Ridge and Golden Eagle Plantation.